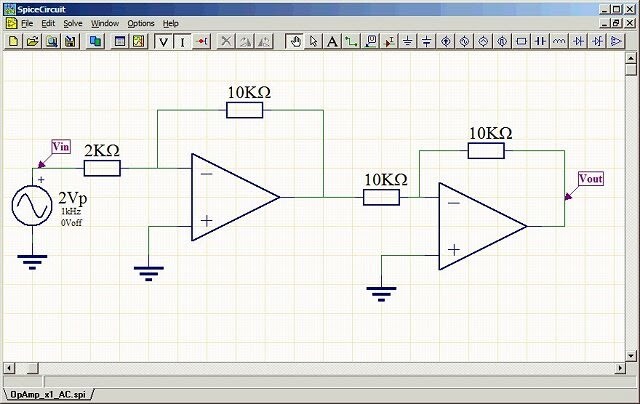 Analog electronic circuit simulation application. SpiceCircuit – is a full graphical circuit entry and simulation application. It utilises a compilation of the open source NGSpice library (http://ngspice.sourceforge.net/) to perform the simulation. Hence the simulation utilises a professional and proven crowd sourced simulation engine. The application operates similar to any other SPICE circuit simulator, and in many cases is not as complete, or fully functional, as other SPICE circuit simulators. SPICE circuit simulation formed a big part of the teaching curriculum of the electronics courses lectured by the author. A number of commercial professional SPICE based applications were utilised during the courses, and there were (free) limited student versions of the software. Yet, the author was very interested in knowing how the SPICE algorithm functioned, thus the author (initially) developed their own SPICE library (based on SPICE algorithms from textbooks). However the author moved on to the more functional, complete, and proven open source NGSpice library. To test the NGSpice library, various (non-user friendly) GUI circuit entry interfaces were developed, which examined the specifics of the NGSpice circuit simulator. This SpiceCircuit application is a (simplified) compilation of the developed GUI interfaces. It was simplified, so as to attempt to produce a user friendly (but limited) functional SPICE application. This is a functional version of the program. Thus, *NO* limitations to the software execution have been imposed. However the program is still in the Beta development stage, and thus there are still a number of incomplete aspects of the application. This program is freeware, hence the Author gives permission for making copies of this program, and using this software for the users own purposes. If you use the program, it would be nice to get an Email. I would also like to know your comments, and any additions that would benefit the program. No liability whatsoever for the program operation, use of the data, accuracy of the data, loss of information, or anything else is accepted by the author of this program. Due to the increasing legal concerns, the user of the software must first agree to the 'Licence Agreement' form that will be displayed on first run of the software. This 'Licence Agreement' information provides a more in-depth coverage on the 'no liability' status of this 'as is' supplied free software. There is a Help information section that provides the basics of the program, but other than that, there are currently NO other Help files for the software. Download this file, unzip it, and run the installer executable.